Call/email to receive free information on this exciting new offering. Maximum Carpet & Restoration is the first and only authorized applicator of BactiBarrier in Wyoming. H1H1... MRSA... E. coli... Salmonella... Mold... Allergens... The world we live in is a dangerous place. You take every precaution: you wash your hands and are careful about what you touch. Still, you can’t help feeling vulnerable. Chemists have responded with a dizzying array of products to destroy germs. Most of these antimicrobials use metals or poisons that leach into the surrounding environment to kill offending organisms. These agents create a halo of diminishing efficacy around the area of application. Microbes near the center of this halo are usually eliminated, but those on the outer edge, where the strength of the poison is greatly reduced, survive and mutate into resistant strains, known as “Super Bugs”. The answer? The BactiBarrier Cleaning System. 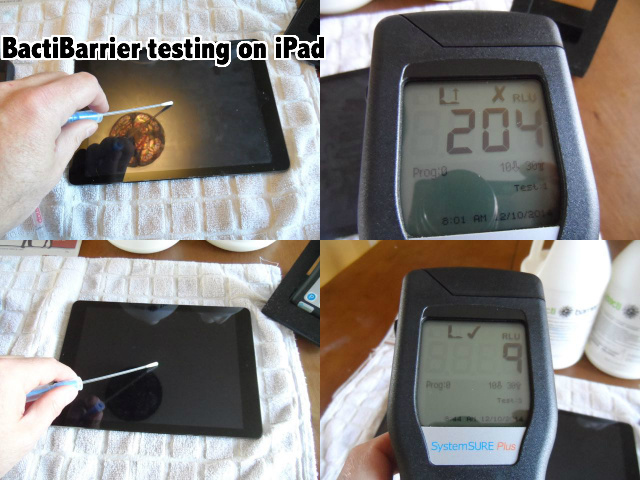 The BactiBarrier® cleaning system approaches cleaning in a more logical way. We have achieved groundbreaking success using our two-step cleaning system. 1. First we remove and neutralize unwanted microbes by cleaning away pollutants using our premium EPA registered Disinfectant/ Cleaner antimicrobial. 2. Second we apply an odorless, bound, EPA-registered, antimicrobial barrier of protection on surfaces that may be exposed to future harmful microbial growth. This two-part cleaning and protection system is a unique combination of both innovative procedures and chemistry. Efficient and effective cleaning procedures require careful attention to details. Proper application, coverage and dwell time of our Step 1 BactiBarrier Disinfectant/Cleaner antimicrobial will eliminate 99.9 % of the unwanted microbial growth that builds up on a hard surface. BactiBarrier Protector or Step 2, applied properly, provides a bonded, long-term, antimicrobial protective barrier. This chemistry works slightly different than the first step. Its unique charged mechanical action actually inhibits microbial growth for months or even years on/in specific undisturbed hard and soft surfaces. Some examples of potential applications: Healthcare, building and remodeling, athletic facilities, transportation, education, day-care, hotels and restaurants, correctional facilities, cruise lines, residential, business, marine, medical devices, industry and government, etc. This is just a small sampling of where BactiBarrier can be applied. The comprehensive BactiBarrier Cleaning System can dramatically reduce the bio-load on touch surfaces, while lowering airborne contaminants in the process. The BactiBarrier System creates a biological safety net over your entire environment, protecting you from pathogenic organisms and fungi, month after month.